Primary Tumor Staging = pT1. The tumor has not spread beyond the testicle and the epididymis. Cancer cells where not found inside blood vessels or lymph vessels next to the tumor. The cancer may have entered the tunica albuginea, but not the tunica vaginalis. Regional Lymph Nodes Staging = N0. No spread to the nearby lymph nodes was seen during the biopsy or on the CT scan. Distant Metastasis = M0. There was no observed spread of the cancer outside the area of the tumor or to other organs, like the lungs. Serum Tumor Markers = S1. HDG and LDH are normal. AFP was slightly elevated at 15 before the oriectomy, but went down after the testicle was removed. The cancer types were: 40% seminoma, 20% embryonal carcinoma, 20% yolk sac, and 20% Mature Teratoma. Multiple cancers are treated as nonseminoma. To treat this cancer, you can choose between surveillance, RPLND, chemo, or some combination. The graphic shown above was drawn with RFFlow and allows you to look at each possibility and see roughly what your chances are of avoiding further treatment. If you choose surveillance, there is a 70% chance that you are done and the cancer will not relapse. There is also a 30% chance it will show up again and then you have to go through chemo or RPLND. Both chemo and RPLND have serious possible side effects. If you choose RPLND (Retroperitoneal lymph node dissection) after the radical inguinal orchiectomy, you increase the odds that you won't have to do chemo to around 85%. However, for 70% of patients who go through RPLND, no cancer is found in their lymph nodes. RPLND is major surgery with possible side effects. If you choose chemo immediately after the orchiectomy, then your chance of avoiding further treatment goes to 97%. You need to understand what is involved in chemo and RPLND and how you feel about these procedures in making your decision. With testicular cancer, no one wins. You just try to minimize your losses. 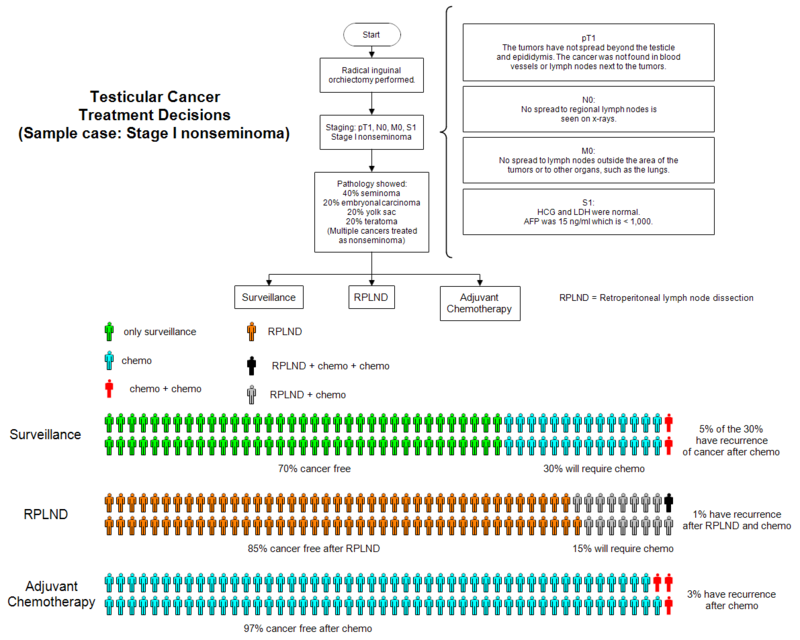 Once RFFlow is installed, you can open the above chart in RFFlow by clicking on testicular-cancer-treatment-stage-1.flo. From there you can zoom in, edit, and print this sample chart. It is often easier to modify an existing chart than to draw it from scratch.